Did you know that July and August are both considered National Peach Month? It’s true! So don’t stop celebrating! 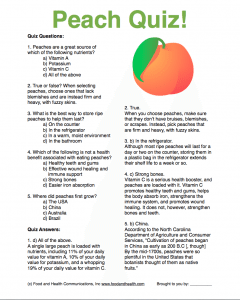 Instead, share this fantastic peach quiz with your clients. If you scroll to the bottom of the post, you'll even find a free handout that you can get today! 1. Peaches are a great source of which of the following nutrients? 2. True or false? When selecting peaches, choose ones that lack blemishes and are instead firm and heavy, with fuzzy skins. 3. What is the best way to store ripe peaches to help them last? 4. 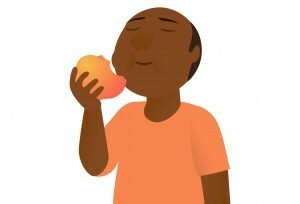 Which of the following is not a health benefit associated with eating peaches? 5. Where did peaches first grow? 1. d) All of the above. 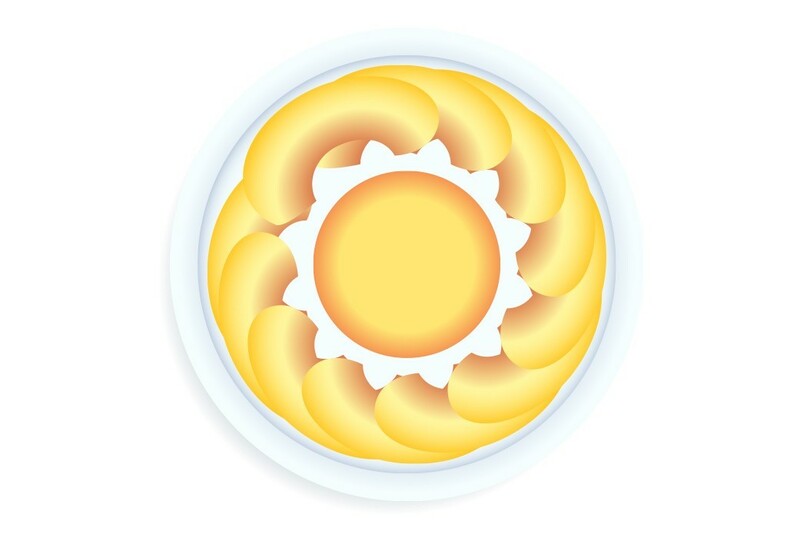 A single large peach is loaded with nutrients, including 11% of your daily value for vitamin A, 10% of your daily value for potassium, and a whopping 19% of your daily value for vitamin C. Peaches are also great sources of fiber and niacin, while offering little to no saturated fat, cholesterol, or sodium. 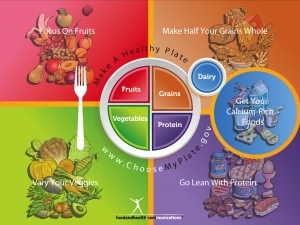 (Source for nutrition data). 2. True. 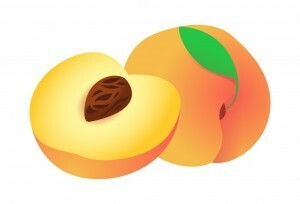 When you choose peaches, make sure that they don't have bruises, blemishes, or scrapes. Instead, pick peaches that are firm and heavy, with fuzzy skins. Peaches should yield to gentle pressure when ripe, but, since they bruise easily, it's vital to be very careful with them. Handle them gently, from selection to preparation. 3. b) In the refrigerator. Although most ripe peaches will last for a day or two on the counter, storing them in a plastic bag in the refrigerator extends their shelf life to a week or so (source). 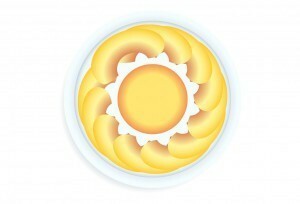 Once a mature peach starts to ripen, it doesn't stop -- it can only be slowed. The fridge is the best way to do that. To speed up the ripening process, on the other hand, it's best to store peaches in a paper bag on the counter. 4. c) Strong bones. Vitamin C is a serious health booster, and peaches are loaded with it. Vitamin C promotes healthy teeth and gums, helps the body absorb iron, strengthens the immune system, and promotes wound healing. It does not, however, strengthen bones and teeth. For that particular health benefit, look for calcium-rich foods like skim milk or nonfat yogurt. 5. b) China. This was a bit of a tricky one. According to the North Carolina Department of Agriculture and Consumer Services, "Cultivation of peaches began in China as early as 200 B.C [, though] By the mid-1700s, peaches were so plentiful in the United States that botanists thought of them as native fruits." California is the largest producer of American-grown peaches, followed by South Carolina and Georgia (source). Of course, one of my absolute favorite recipes is now exclusively available to members. 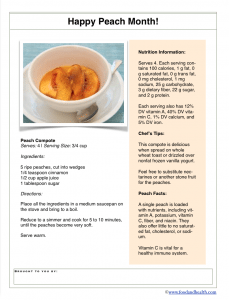 Check out the post Peach Month Recipe: Peach Compote for a tasty new spin on peaches that is as delicious as it is versatile. There's even a new PDF handout! 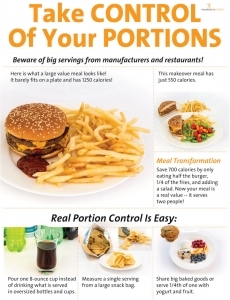 And, as always, there's more in the Nutrition Education Store. After all, we're here to help you look your very best, right now!